The new DO.C. will try to clarify. Brett hurt his wrist running the ball down in a Texas game. Smith took over and it didn't look like Brett was going to get the job back. So he got Wally Pipped by Alex Smith is what you're trying to say. But agreed, he was nails as a D3 QB. Legit D1 talent tearing defenses up for a few years. Some epic playoff games, the UWW one in particular comes to mind. I did cough up the $45 dollars to watch St John's home games this season even though I came up for the season opener against UW-Stout & plan on making the 5 hour trek from northwest Iowa to watch the non-conference regular season ending matchup with Thomas More. 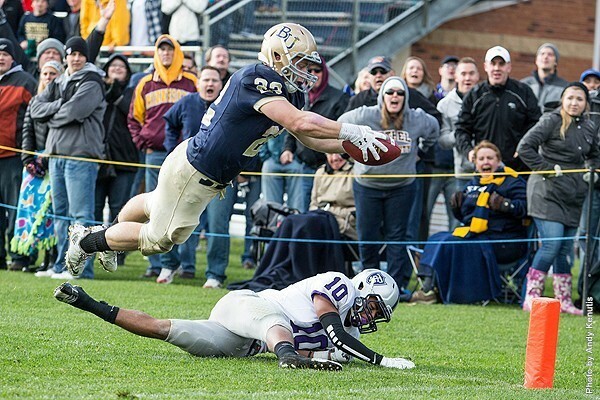 The JOHNNIE/Tommie game can be seen in all it's glory "on demand" on Stretch! "I'm a uniter...not a divider." I'm not entirely convinced they were "hiding" it before? If so, maybe they were really thinking ahead by intentionally frequently allowing the BU defense to get pressures on Erdmann. When he had some time vs. BU, he made some really nice throws, but the SJU o-line simply didn't look up to the task of keeping UST at bay, at least that Saturday. I'd buy that Fasching at co. viewed the UST secondary as a potential weakness and game planned a pass-heavy day, but giving Erdmann enough time to exploit was the real surprise to me. I'm curious what you mean by "help them with the committee." They've outscored opponents 257-49 and beat U$T thus far. I don't really think trouncing a few mediocre MIAC teams will impress anyone. The name of the game now is winning out and keeping everyone healthy. Edit: I don't believe for an instant that SJU was "hiding" that offense. I think they came up with a solid game plan for U$T and executed it. SJU was able to make UST pay for bringing pressure on 85% of the plays. Live by the sword/ die by the sword as the old saying goes. By not changing their plan of attack in the 2nd half,UST felt they could bring enough pressure to tip the scales. They didn't and as they say "the rest is history"
As of now they're on DOUBLE SECRET Probation! Long Live the Red Party Cup! Can't look past Concordia (or St. Olaf for that matter). Going to Moorhead is one that screams "trap game" to me. I'd hate to go there with our heads in the clouds and have the Cobbers keep it close by making the most of their possessions and controlling the ball for 40-plus minutes. (See SJU v. Concordia-Moorhead, 2012, 2014). And you've got us feelin' alright. The Concordia game could have other implications too. Whitewater likely will win out. At the end of the year UWW and SJU will have two common opponents; Stout and Concordia. The differential in those results may determine the final #1 seed in the tournament. Mount, MHB, and Brockport are likely shoe-in's for the other 1's, given they will run the table and have last years playoff results to lean on. Being a 1 seed is advantageous to avoiding a team like John Carroll or St Thomas in round 2. Definitely a factor, and in recent years the committee has looked beyond just "X beat Y and Z beat Y" in order to rank teams. So if X beats Y by a field goal and Z beats Y by 24 points, that would be something they could consider. But if X beats Y by 14 and Z beats Y by 10, 17, 21, that's usually not considered significantly different. If this is true why is Brockport ranked ahead of SJU? They don’t have a better resume but have only beat the teams they have played, which have been mostly subpar by a lot and are ranked #3? The Top25 here is not reflective of the committee for one.